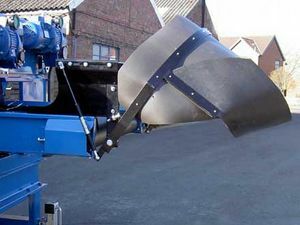 This semi automatic fallbreaker cushions the fall of crop into a box. The fallbreaker is manually pivoted into the empty box. Two pneumatic cylinders hold the rubber chute in the box. As the crop fills the box and begins to fill the rubber chute, the extra weight pushes the fallbreaker up and out ofthe box.